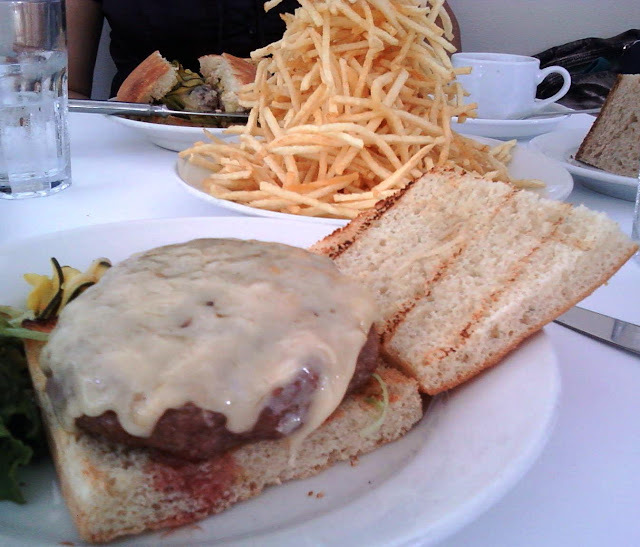 It had been a crappy couple of burger days in San Francisco when Tess of the B'Urgervilles and I went to the much lauded Zuni Cafe for their signature, house-ground burgers. Keep in mind that this cheeseburger was served on GD focaccia, so one can imagine the gustatory hell that we were about to enter. The burger was 17 bucks, and the cheese (something snooty in the White Cheddar family) was an additional $1.75......dicks. Ready...Set...Terrible! The burger arrived and looked fine until it was flipped over to reveal a cool, grill treatment, so it had weak sear marks and a rubbery crust. The focaccia (rosemary) was oddly lacking both rosemary and the customary, slightly chewy and firm texture--it was more like cornbread. Bite one--hmmm that's oddly gamy--I wonder if it's just me--looks across table to see similar look of confusion mirrored on dining partner's face. Bite two--well, that's sort of........fishy tasting and reaching for unpleasant. Bite three--this is downright unsettling. Bite four--no, it's just plain off-putting. Bite five--there was no bite five. I have failed--I could not choke this one down. 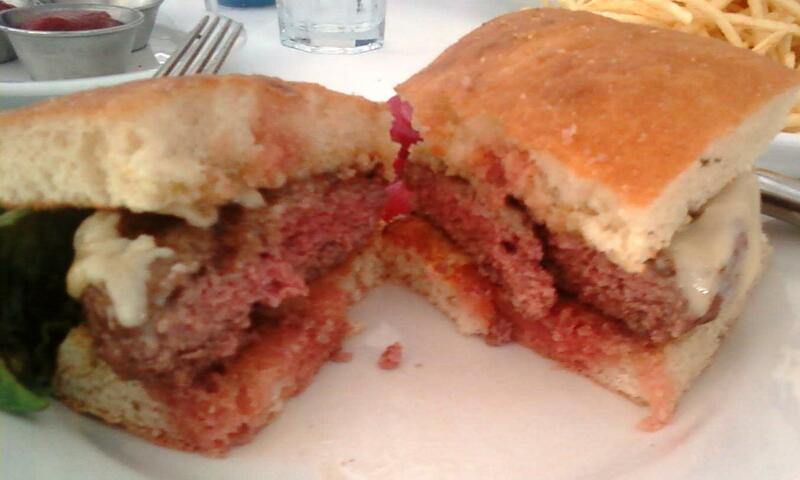 However, I consider myself a survivor of the single worst burger that I have ever tried. It was a crapcake--and that was actually insulting to cakes of crap everywhere. The grind was fine as polenta, and the flavor was pure, fishy skank. It was also remarkably firm, which suggested that they took puréed ground round, added dashinomoto (bonito flakes) or fish food, and an egg--whizzed it up in a food processor while going out back to smoke, and then caught up with an old friend for ten minutes before realizing the mixture was nearly liquefied, and then saying "eff it, let's serve it anyway." The cooked burger ended up being a meatloaf made with Gerber baby food with the flavor of overly "ripe" salmon. I assume that they did not bother trimming the beef deeply enough and handed us a burger made from the bacteria-rich rind of the dry-aged beef. The mouth feel was ghastly--mealy, vaguely toasted focaccia sandwiching mealy "beef" with a greasy wad of salty cheese. More sadly, the dubious focaccia dutifully soaked up the fishy drippings to deliver a bite of something resembling a soggy, carp-flavored brownie. The waitress sheepishly hustled away the plates of 2/3rds consumed burgers and brought us a dessert menu to cleanse our palettes. The strawberry sorbet was bright, sunny, and bursting with fruit flavor, and the peach meringata dish was a work of genius from the dual perspectives of texture and flavor. That meant that someone in the Zuni Cafe kitchen was worth a damn, but it certainly was not the guy on the grill. In all fairness, the burgers were removed from the tab. There were other patrons in the restaurant that were not revolted by similar looking burgers, which suggests that either we got a bad batch or that the other patrons were OK with the food. Burger Review : Astonishingly bad. Tee up Destiny's Child's I'm a Survivor, and just walk the other way. You really, really don't want to know. I could still taste it 24 hours later. "Tess of the B'Urgervilles"? An English-major joke? You do write like them-there English majors -- can't scan, can't spell, can't gramm. 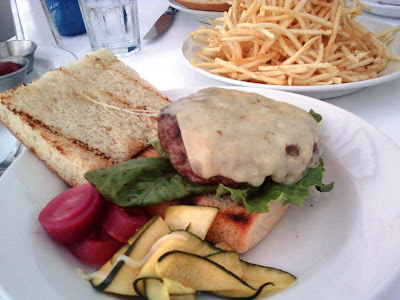 Look up Judy's recipe for her Zuni Café (not Café Zuni) burger, and you won't see anything resembling fish. So if that's what you tasted, it had to come off a dirty grill. But I've often sat at one of the tables with a clear view of the open kitchen, and those people work hard cleaning, as well as cooking. Are you sure it wasn't the foil packets of Chinese fish sauce that you snuck into the joint, thinking you were at Father's Office? Your Zuni writeup illustrates why I react so negatively to most of your reviews, even though I agree with you on many points. Zuni Café is an outstanding restaurant that you ... I believe the young people use the word "diss" ... out of some need in your suburban soul for bourgeois humor and sticky fingers. I probably haven't had one of Zuni's much-loved burgers in 20 years, because I love everything else (except the vinegary bread salad) so much -- for example, the airy ricotta gnocchi followed by the intensely strong and sweet espresso granita. But I'll try one next time. By the way, how did the conversation go when you complained that the burger was awful and tasted like feesh? Sigh....No English majors on this team. I'm an ex-chef, ex-microbiologist, and a guy that likes quality food. I call 'em like I see 'em, and the good people at Zuni comped the burgers, because they were inedible. The waitress wouldn't make eye contact after she took them away, and we were very polite with her when we suggested that something was terribly wrong with the cheeseburgers. My suburban soul is blessed with good enough manners not to shoot the messenger. I felt the review was balanced, since I did lavish praise on the desserts. The desserts were spectacular. Thanks for reading and making this a conversation. Here's that recipe for the Zuni Cafe burgers. Note that had they followed this recipe, then the burgers would have merely been bland and completely uninteresting. This would have warranted a rating of 2 or maybe 3 Bites. As it stood, someone got jiggy with the recipe and created the WORST THING THAT WE EVER TRIED. 1. Cut meat into 1-inch strips, and place in a medium bowl. Toss with salt, cover loosely with plastic wrap, and refrigerate for 18 to 24 hours. 2. Assemble a meat grinder with a 3/16-inch die and a sharp knife. Refrigerate grinder until thoroughly chilled (this will ensure proper texture and flavor). 3. Pass meat through the grinder twice. On the first pass, pay special attention that the meat is emerging cleanly and evenly. If it isn't, turn the grinder off immediately, and remove and clean the blade and knife. Reinstall and finish grinding the meat. As an alternative to grinding the meat, you can finely chop it by hand or in a food processor with a very sharp blade, however, this will result in a more fragile burger. 4. Working quickly, divide beef into four portions, and form into 3/4-inch-thick patties. Press patties a bit thinner in the center; the meat shrinks as it cooks and the patties will emerge an even thickness only if they start out thinner in the center. The patties may be made ahead up to this point and refrigerated, loosely covered, up to 12 hours ahead. 5. To cook the hamburgers on the stovetop: Choose a skillet (preferably cast-iron) not much larger than will hold the patties. Heat the pan over medium heat until the meat sizzles on contact. Cook until golden brown, about 3 minutes per side. Reduce heat to medium-low, and continue to cook, flipping patties twice, 4 minutes more for medium-rare. Remove from heat, and let rest for 2 to 3 minutes before serving. 6. Serve on foccacia with aioli and lettuce; serve pickles on the side. salt and THEN let them sit for a day??? That's downright retarded. How come no one has mentioned that HUMUNGOOUS pile of french fries in that back ?? Is this normal in the states? Looks amazing!